Camperbug features campervans for hire from owners based across the county in Locations such as Sunderland and Darlington. If you are looking for classic vw campervan hire or even a newer campervan contact us and we can suggest a van for pick up across Durham including destinations such as Hartlepool, Stockton-on-Tees, Washington. I am Olive1979, hire me today! 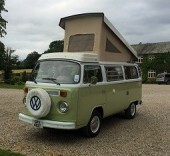 Olive from Darlington, County Durham available for self drive hire and also Classic VW Chauffeur driven hire. If you love campervans you will love us. We guarantee a smile when you drive Olive and a very friendly service from us. Based in Darlington, we are the perfect starting location for adventures in the North East. Unlimited mileage, fully comprehensive insurance for one driver and full breakdown cover as standard. We will even pick you up from the train station if you don't want to travel by car to us. 2016 Volkswagen Transporter T6 Fully converted into 4 Berth Camper van in January 2018. No expense spared on this camper van conversion.